The Triumph TR3B sports car was introduced in 1961. As was the case with the TR3A, the designation "TR3B" was an unofficial one given to those TR3's built near the end of their production run in 1962. The reason behind the short (just one year) production run of the TR3B was that some dealers in the US had expressed concerns that, following the successful sales performance of the TR3 series, the forthcoming launch of the TR4 might not be well received by the market. Owing to inaccurate sales forecasting and production scheduling, there was a surplus of unsold TR3A's in the run up to the launch of the TR4 in 1961. Consequently, US dealers were using up existing TR3A's, and adding the new TR4, all synchromesh gearbox to make them more marketable. In fact, some of these dealers were actually calling these uprated models TR3B's to increase their appeal. Furthermore, the TR3B's were built alongside the TR4's throughout 1961 to 1962 until it was obvious that the new model had been accepted by the US market. At this point, the TR3B's would be phased out. In terms of appearance, it was identical to the TR3A. However, the main difference between the two was in terms of the engine. The TR3B was to be regarded as a stop gap measure prior to the launch of the TR4. It was intended solely as an export model to the US. Early models continued to use the 2 litre, TR3A engine. However, later versions were given the 2.1 litre, TR4 engine, and a gearbox with synchromesh on all forward gears. 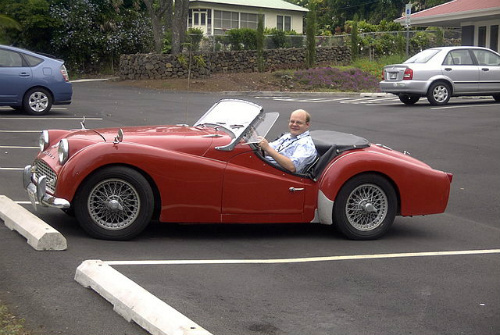 Like the TR3A, it was a two door, two seater convertible, and marketed solely in the US. The later 2.1 litre engine was an in line, 4-cylinder, three bearing crankshaft unit, and used wet liners for ease of repair. 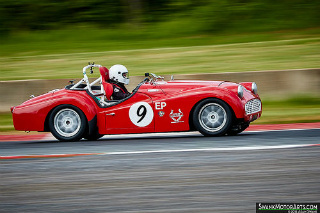 The compression ratio was increased from 8.5 on the TR3 to 9.0. It was fitted with two SU carburettors. The existing gear ratios meant that the TR3B was unable to exceed 110 mph. However, a Laycock-de-Normanville overdrive, operated by a switch, was available as an optional extra. It operated on the top three gears, and was an invaluable addition. As it turned out, the dealers' fears were unfounded since, in the end, the TR4 proved to be very successful, and continued the legend established by the TR2 and TR3. A 1961-62 Triumph TR3B, in good condition, could fetch around £16,000/$25,000, whilst an example in excellent condition could command anything up to £25,000/$40,000.